Some of you may be aware of my fondness for car parks as prime birding locations - they often provide some great birds. 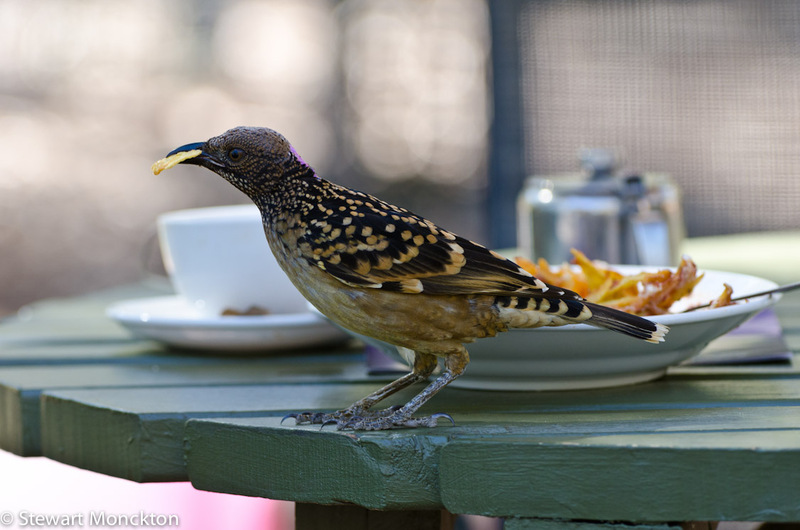 Another of my personal favourite locations to watch birds is around the tables of cafes on the edge of Nature Reserves or Botanical Gardens. The Olive Pink Botanic Gardens in Alice Springs proved to one of the better examples of this generally neglected habitat. 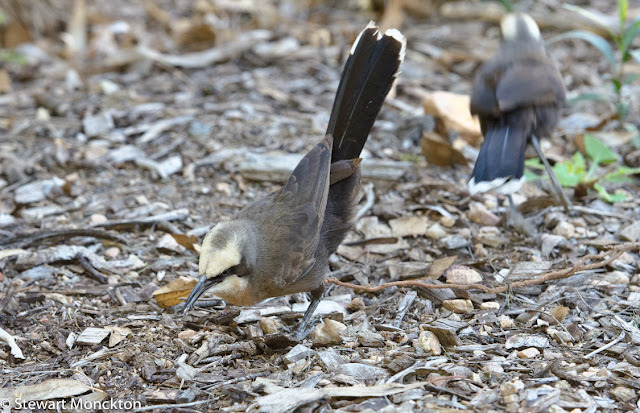 Keen followers of WBW will have seen the Spotted Bower Birds last week - now I bring you another "lunch time" bird - the Grey-Crowned Babbler. This bird - formally addressed as Pomatostomus temporalis - is one of the most amusing birds I have had the pleasure to watch. They are highly vocal, with ringing a "yahoo" being their signature call. They also move around in groups - squabbling and fighting with each other in the branches, on the ground and (in this case) in the tables in front of us. 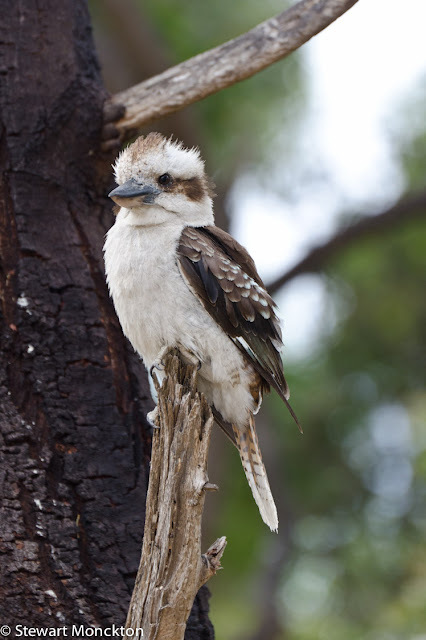 If there was ever a single bird that could convert a person to the charms of birding it would be this one. One of the other interesting aspects of this birds biology is its breeding strategy. 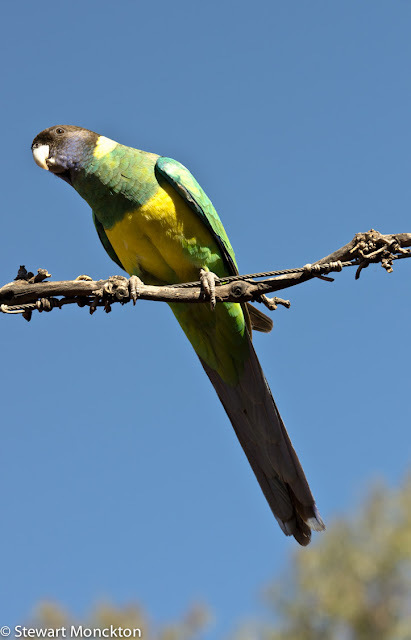 They are co-operative breeders - meaning that the groups that they move around in are likely to be family groups. 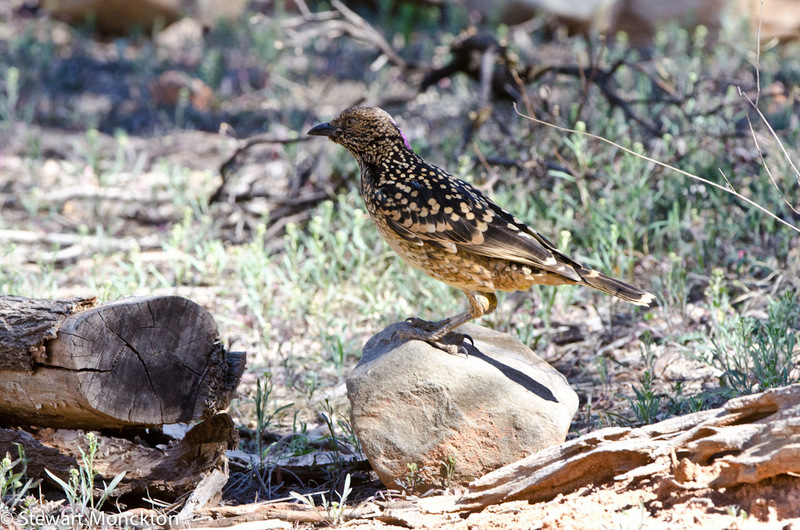 The dominate (parent) pair are assisted by their own offspring from previous years. 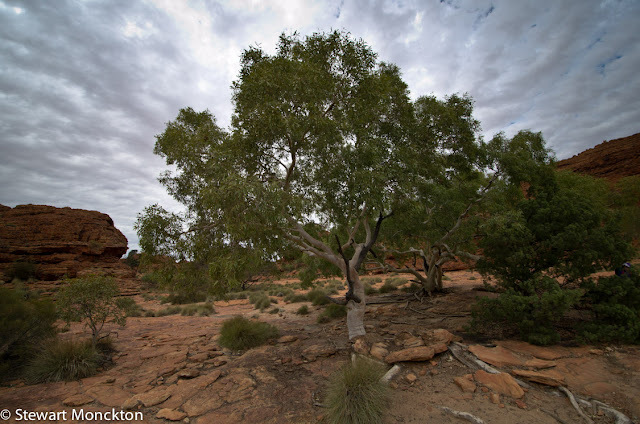 This is considered to be an adaptation to the highly variable nature of the Australian climate, where we move from boom to bust in the turn of a year. In such a variable climate having some assistance in bad years helps ensure success. Driving away from Kings Canyon with some good memories and a very sore ankle (thats when I did it) took us towards one of Australia's best know landmarks - Uluru - or Ayers Rock as it was called by the white explorers who thought that they had discovered it. They seemed not to notice that it already had a name, and had had one for may 45,000 years! However, there is a trap awaiting the unwary. Well before Uluru can bee seen another flat topped landmark pops into view - its called Attila or Artilla or even Mount Conner. 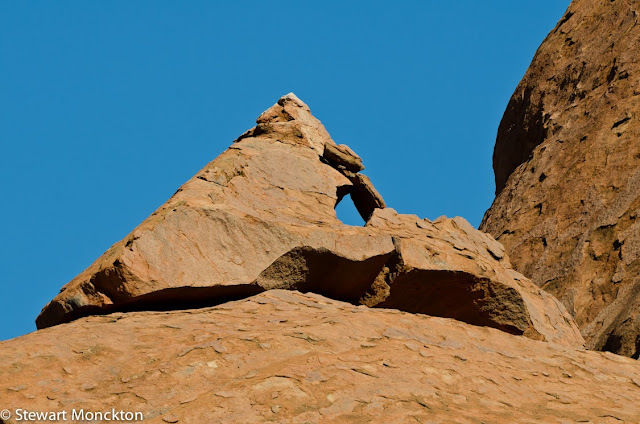 If you have never seen these kinds of landforms before I can see why they may confuse people. And to be honest, they only reason I was not fooled the first time I saw it was because I knew it was there. You can only gain access to Mount Conner of organised tours - so we just had to look from the road. I have to say its an impressive looking place. After a bit more driving you arrive at Uluru - and the views from the road it don't really do justice. As this is supposed to be my "photo-blog" I wont say much more about this remarkable location, except that if you get the chance you should go there. This was my third visit and the impact was no less than the first time I saw it. You can find more pictures from around the world at Our World Tuesday and Travel Photo Monday. Due to a but of an issue with my ankle - sort of self inflicted by running about with H in the dark! - I have not been out and about much over the last couple of weeks. This is an oldish image, where I was trying to do both near and far in a single image. The shape in the sign is a cormorant, one of the more common water birds at Blackburn Lake. I'm glad I have an archive! Two of the overriding colours in central Australia are red and blue - the soil and the sky. I liked the way that many of the buildings used a very similar colour palette. 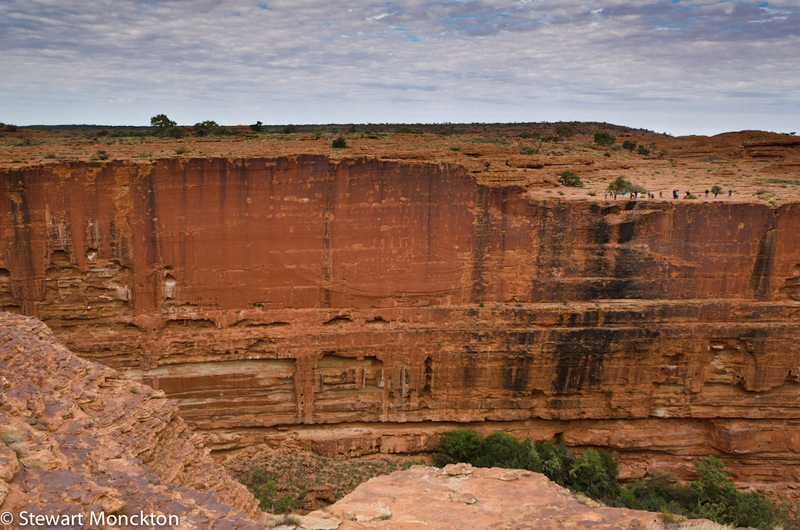 So, here is an abstract central Australian landscape. 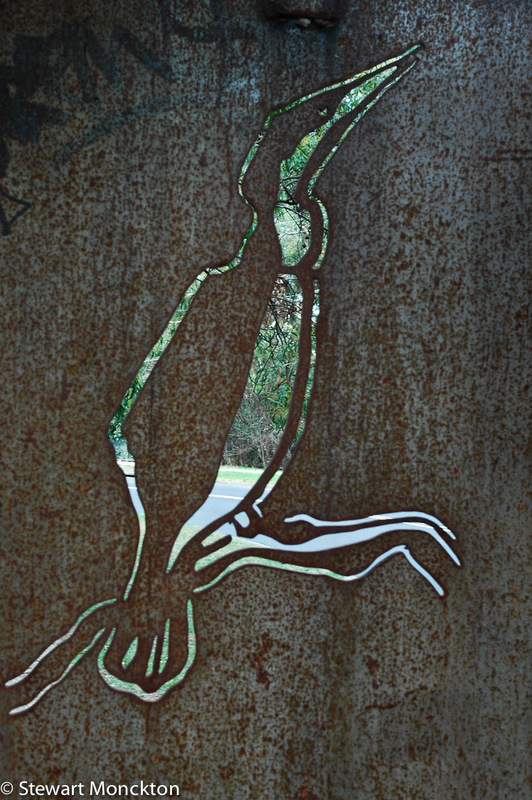 This is a bit of a continuation of a theme of some of my recent observations - birds that you can see in car parks! I have to admit that I have expand "car parks" to include the cafes of Botanic Gardens - but its the same sort of place. 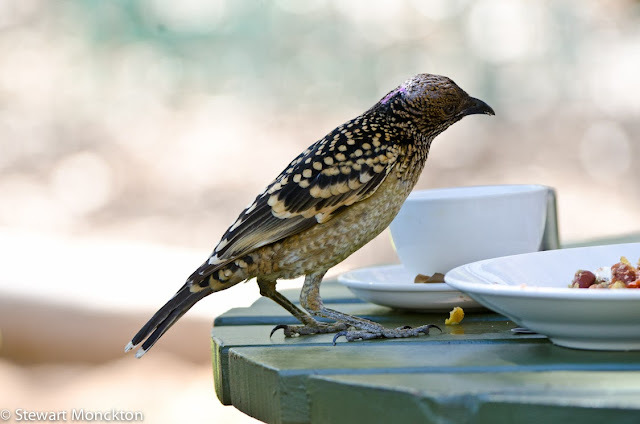 After settling into our accommodation in Alice Springs we went for lunch at the Botanic Gardens - and as soon as we got out of the car a rather strange looking bird landed on a picnic table next to us. I recognised it as a bowerbird of some sort, and rather quickly lost interest in lunch! The bird flew away, and I come not follow it. So, back to lunch. 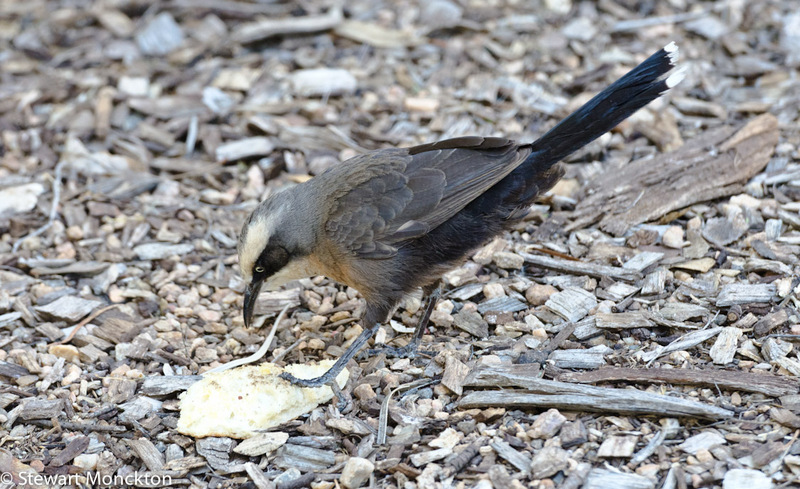 As we were eating a rather fine BLT the bird came back to feed on its preferred food - the abandoned nacho. This was not a wilderness experience. 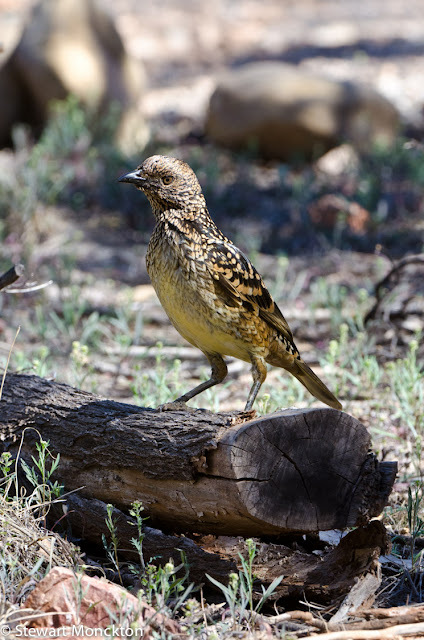 The bird in question is a Western Bowerbird (Chlamydera guttata). The bird is found in two (probably) distinct populations - one in central Australia, and one in Western Australia. 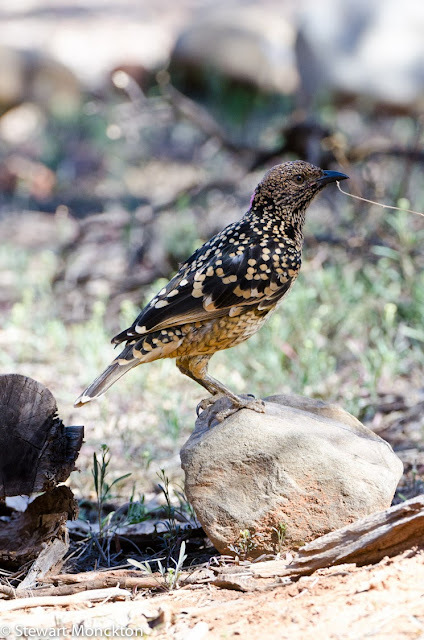 All of the birds in these pictures are from the central Australian population. 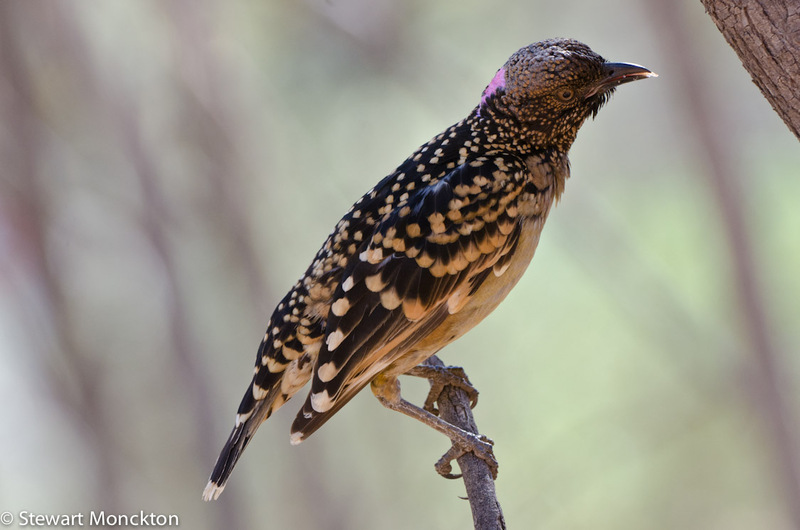 I had a look around the area where I saw the birds, but I could not find any of there display bowers. 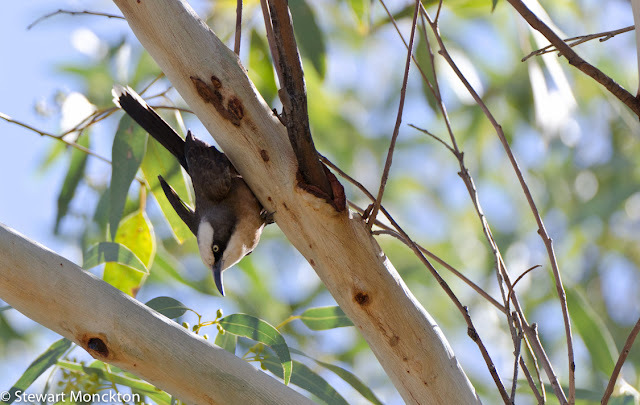 The pink path on the back of the neck of the bird as an 'erectile crest', that can be made to stand up - but I never saw that happen. The next time I saw any of these birds was in (you've guessed it) the car park at Ormiston Gorge - a wonderful cool and shady place. 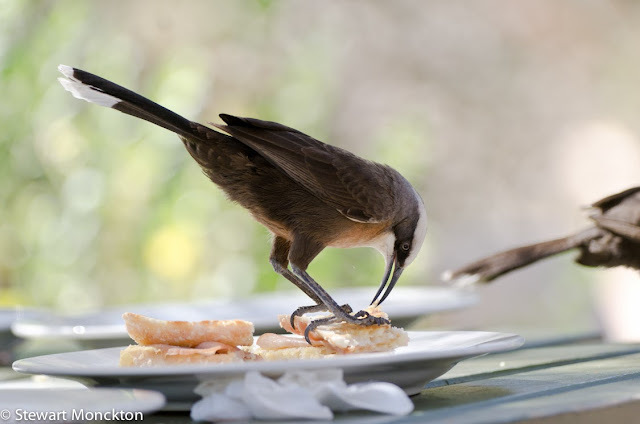 This time the birds did seen to be looking for more natural food, but did not fail to notice the crumbs that fell from our sandwiches. I dont know if the slight cocking of the head to one side is a typical pose - maybe they were just keeping an eye on me. Now its your turn to get involved with WBW. Just click on the link below and off you go. Remember to visit, comment and to link back to this page. 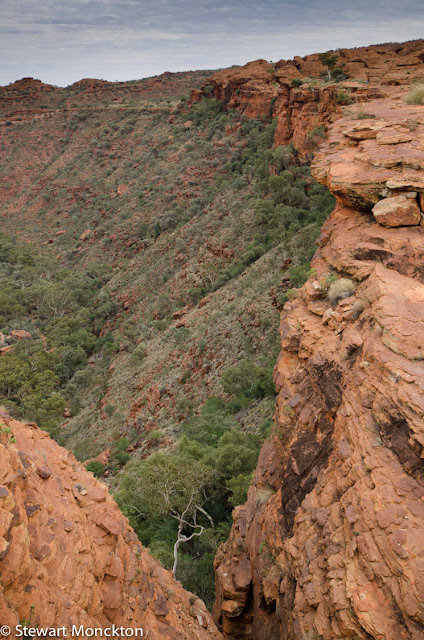 The first part of the walk around the rim of Kings Canyon is a steepish climb up at ridge that sticks out into the valley floor. Although its a rather sharp way to start the walk, it does get almost all of the up out of the way right at the start. Once your "up" you can walk around the rim of the Canyon, with just a short drop back down towards the valley bottom at the canyons narrow point. Its a wonderful walk. 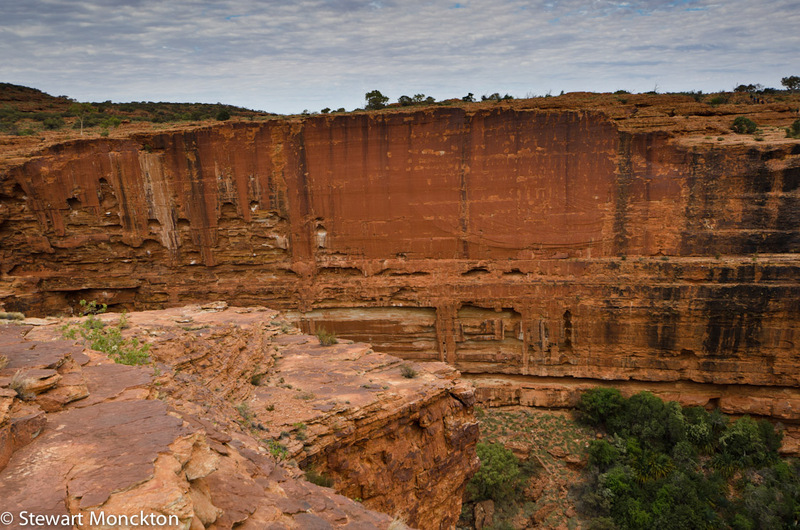 Once you are near the head of the canyon you start to get views of the main walls - which are to say the least rather spectacular. Over millions of years a small crack in the surface has been expended to form this canyon of red and orange rock. The rock of the canyon was formed in the bed of an old sea and in places you can still see the wave ripple marks in the body of the rocks. All it needed was a sand castle and it would have been a modern beach (albeit a rather hard one!). The central tenant of geology is that the present is the key to the past - in other words the things that are happening today, also happened in the past. 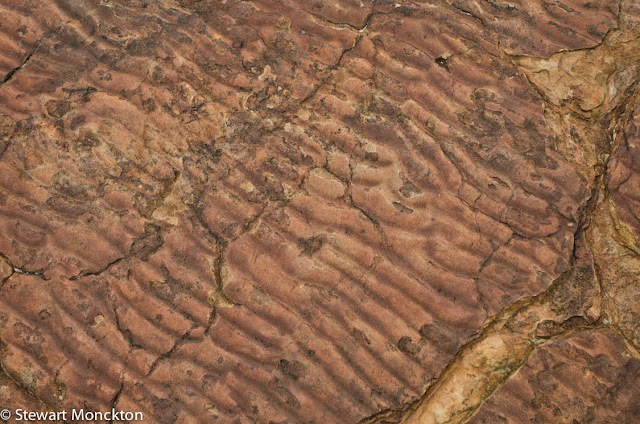 And current geological features, no matter how big, are formed by these same processes. Kings Canyon is one of the best places to see this idea converted into a landscape. You can find more pictures from around the world (and less Grade 8 geology!) 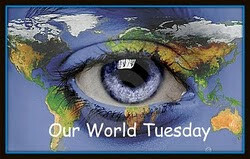 at Our World Tuesday. 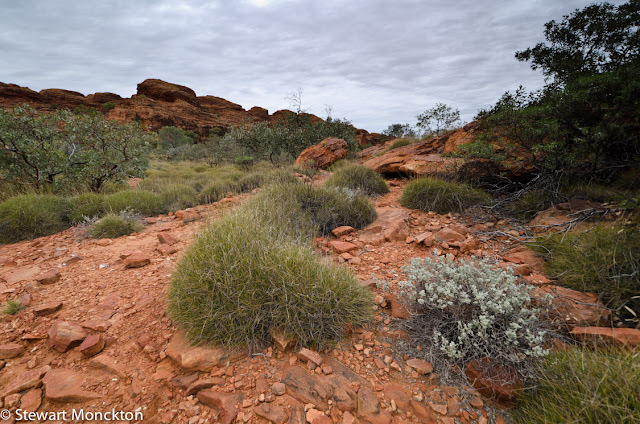 During out short time in central Australia I was struck by a contradiction in what we saw - the landscape seemed to be both harsh and fragile at the same time. I have no idea how hot it must be in the summer, but we were there in winter and the sun was bright and many areas were dry. Equally it was a place that seemed to record the footprints of its passing visitors more clearly than many other places I have been. You did really feel that you could alter the survival of things with a misplaced heavy footstep. Even in the areas that were clearly marked as off limits were criss-crossed with foot marks. I made this pair of images to try to talk about the natural and the manmade and the way they both seemed to be part of my experience. 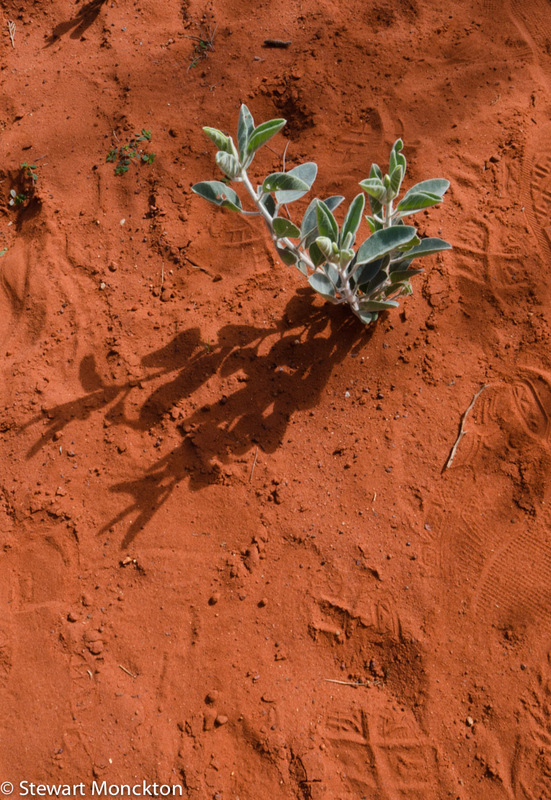 I like the combination of colours and textures against the red dirt of the desert. A classic sky watch activity at Uluru is to watch the sun set on the rock. This is a link to a time lapse video H and I made of a sunset. The real time is about 1 hour and 10 minutes. Enjoy. I did not manage to get any pictures of this rather splendid parrot when I saw them in Perth a few months ago - so I was very pleased to see some in the middle of Alice Springs. We were sitting having lunch when a couple of these colourful birds dropped in to see what was on offer. 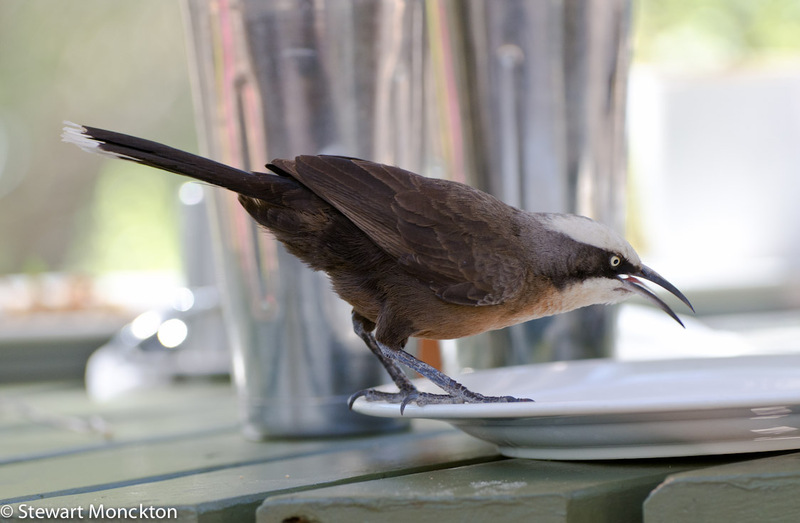 After sizing up the healthy options, one of the birds decided it would have a bit of sweet treat, and it stole a packet of sugar from a nearby table. 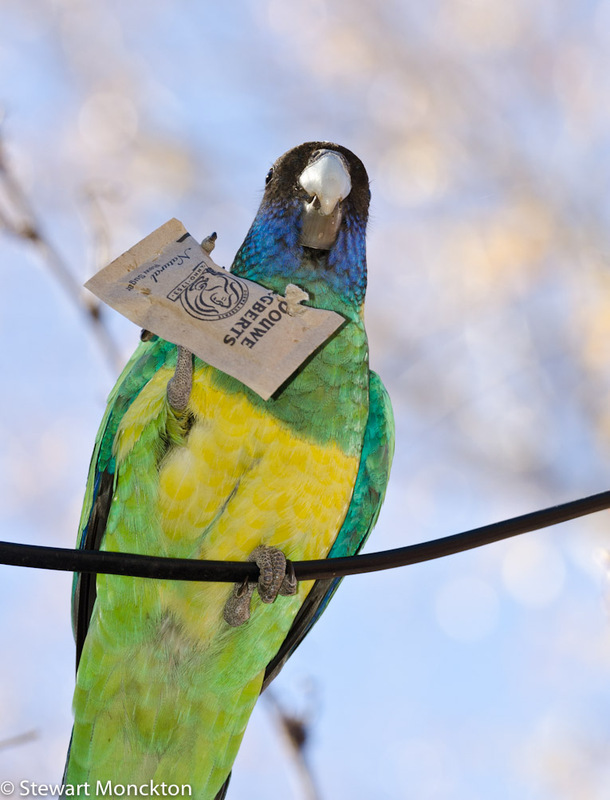 It sat on a wire, opened the packet and eat the sugar - all with one foot! Not hard to work out why these birds are considered highly intelligent. 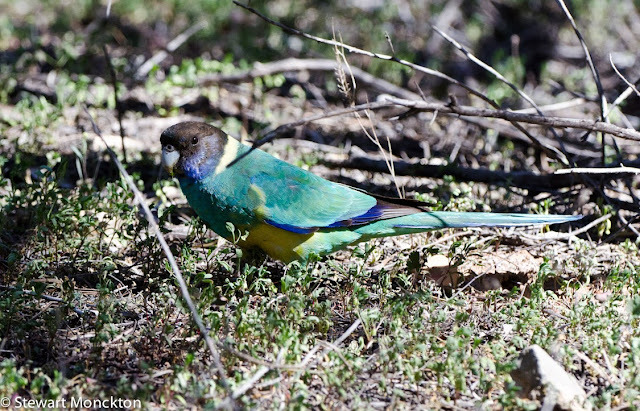 This bird occurs over much of central and western Australia - which is why I need to travel to see it. 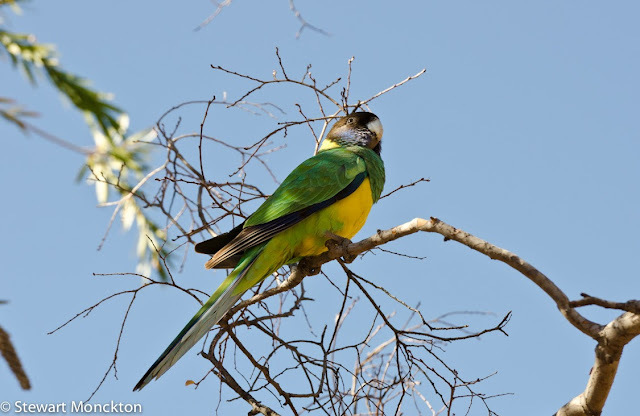 Going by the name of Barnardius zonarius its about 35 cm long and is also called the Port Lincoln Parrot and the Twenty Eight Parrot and The Australian Ringneck (some books consider each of these to be different species, some say that they are just races of one species.) I have to say I rather like them. 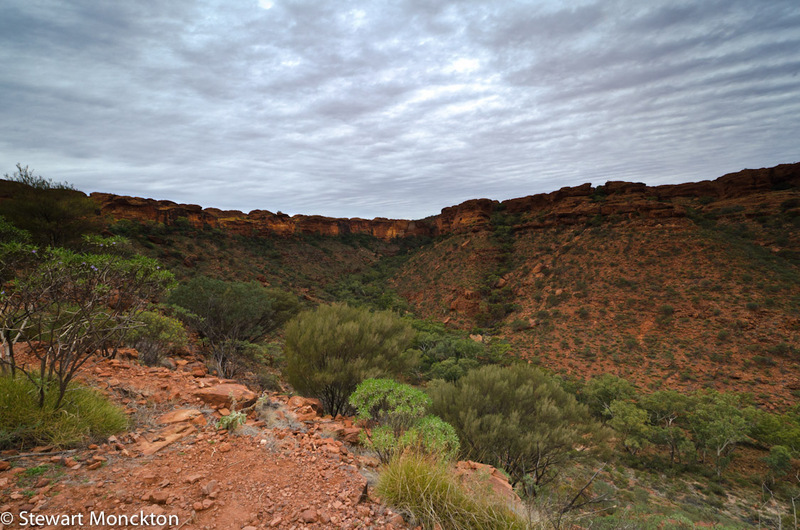 The next picture was taken at Ormiston Gorge on our way to Kings Canyon - it was a wonderful place. 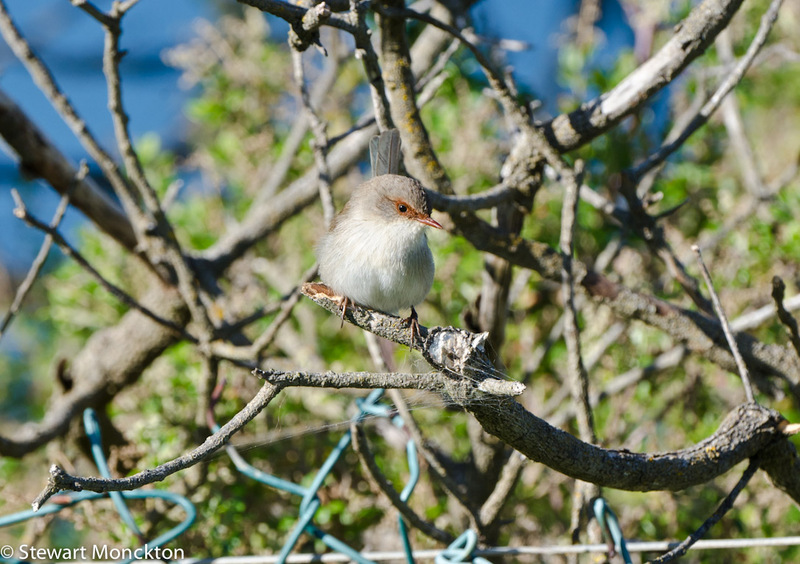 This picture does show that it was not all plain sailing on this trip - the light was almost always a combination of deep shade and bright sunshine - so I was rather pleased to find this bird in dappled sunlight. Now it's your turn to get involved with WBW. Click on the link below and off you go. 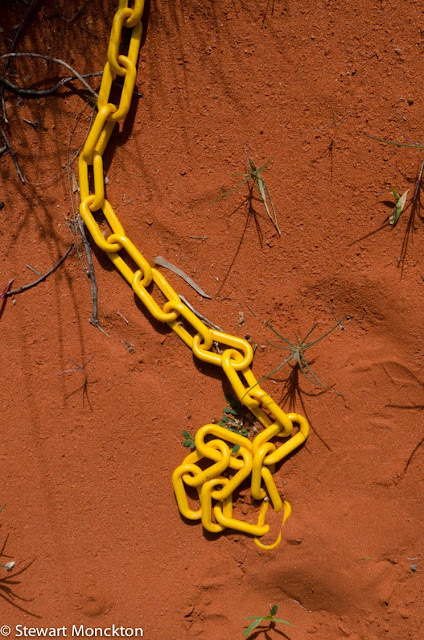 Dont forget to link back to here, and to make your link to a post rather than just he "top" of your blog. Then visit and invite! 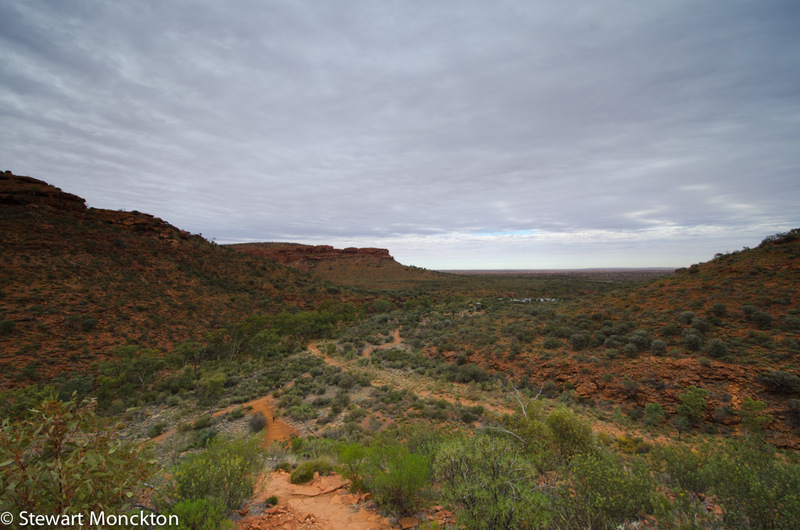 As I mentioned in my last post I have just come back from a week and a bit in central Australia. Wonderful trip - even my kids agreed! We flew into Alice Springs before setting off into the less populated parts of the world! 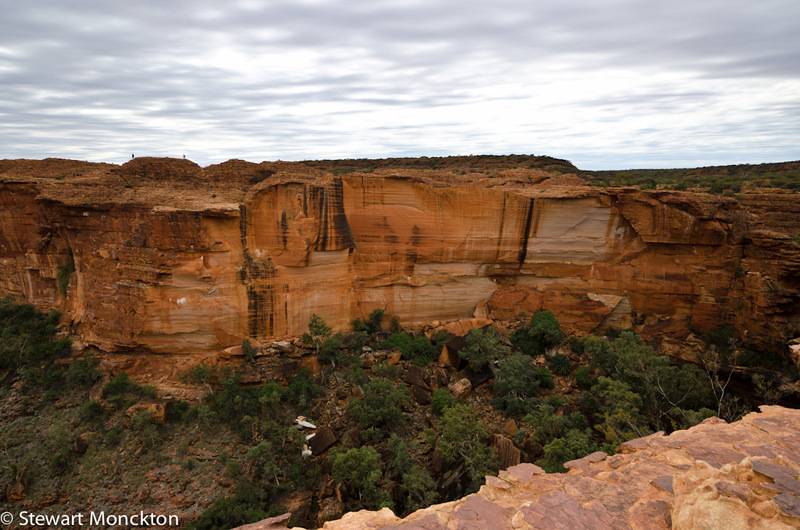 One of the first places we visited was Kings Canyon - which was at the end of a 2 1/2 hour drive along a dirt road. I'd like to shake the hand of who ever invented four wheel drive! 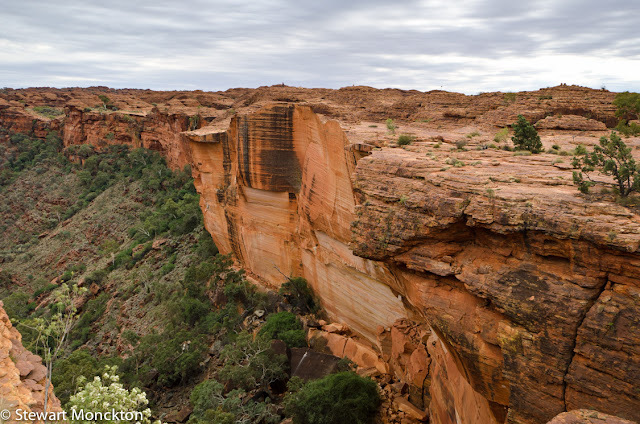 Kings Canyon has a famous canyon! And these are not pictures of it! I need a bit of time to get organised here, way too many pictures to deal with - so here are a few shots I took at the start of the walk that I have already sorted out! More to follow. The sky was not as blue as it could have been, but that did seem to make for some rather good contrasts between the rock and the sky. I love the pale trunks on the gum trees. For those of you who have not been to this part of the world, the overwhelming colour is red! 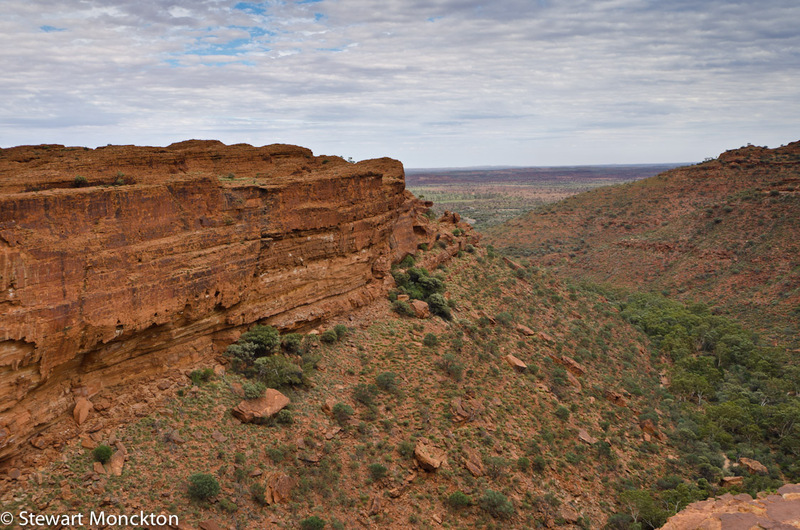 I've just got back from a great trip in central Australia - all red sand and strange looking landscapes. One of the remarkable aspects of this part of the world is the colours created by the setting Sun on the remarkable red rocks. These are, of course, not red rocks, but are something a little more portable. 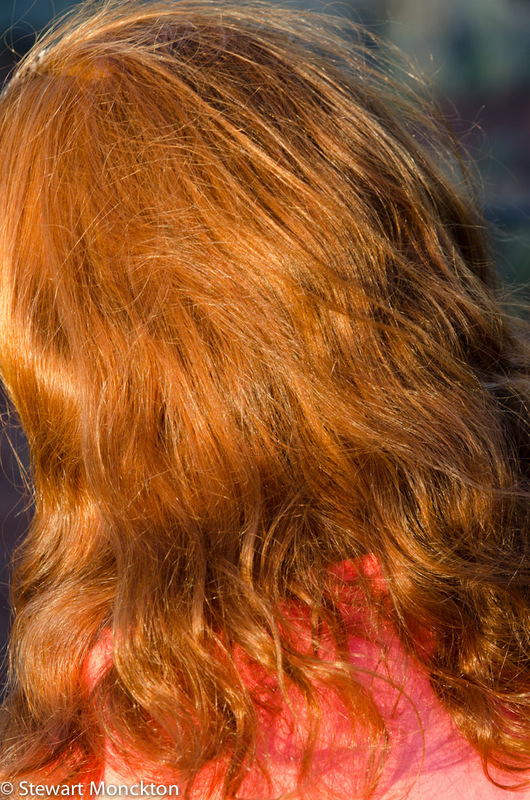 I was photographing one of the famous landscapes in central Australia when I noticed the Sun setting on P's hair - and I thought I'd photograph it. There will be more tradational looking images from central Australia over the next few days. This will be a very short post today. I have liked this image for a long time - I like the way that the parts of it seem so random. 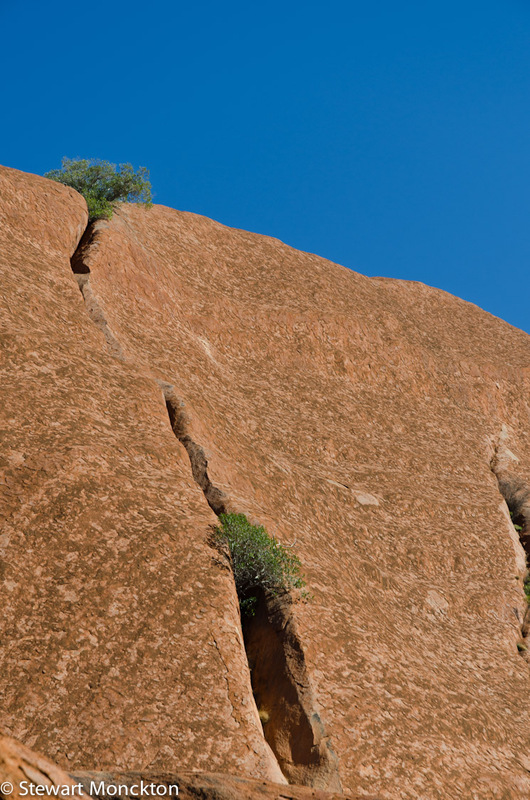 A boulder on a cliff. 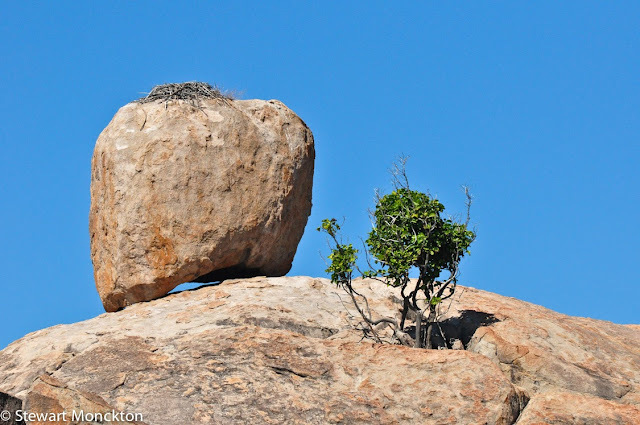 A nest on a boulder. A hole under the boulder with the nest. A tree growing from what seems to be nothing but solid stone. The picture was taken on boat trip around Magnetic Island a few years ago - it was not breeding season for the Sea Eagles that built the nest - so that one last element was missing. That feel like a good reason to go back! You can find more (and probably more expansive!) skies at Sky Watch Friday. This is the 52nd WBW since I picked up the reins from Springman and changed the "World" to "Wild", just to make things feel a more mine! A big thank you to everybody who has linked up and joined in. 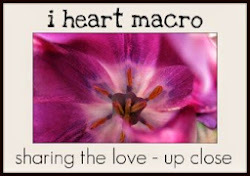 At present we get between about 55 and 70 blog link up each week. But plans are afoot to increase the number!! 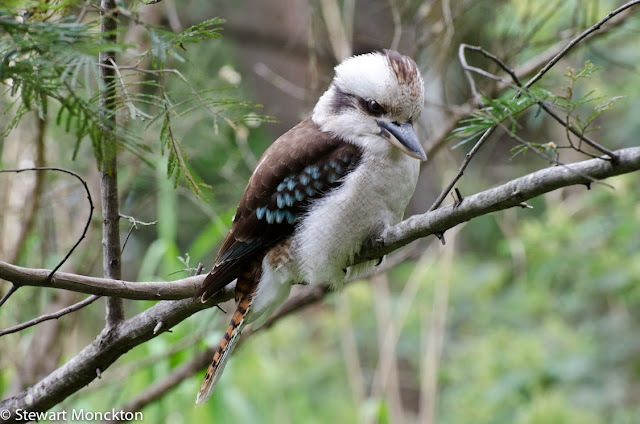 So, given that its an anniversary I thought I'd go with a bit of a classic Australian bird - the Kookaburra. 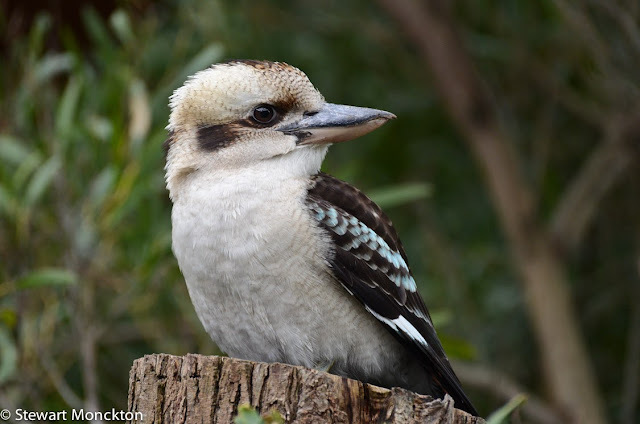 Now most people probably know about - or have heard in old Tarzan movies - the Laughing Kookaburra (Dacelo novaguineae) from books, films and tourist information. There is a good story attached to the scientific name. "Alcedo" is the genus name of a European kingfisher as used by the father of all things binomial Linnaeus. The sharp eyed may have spotted that Dacelo is an anagram of Alcedo. In a 1842 report contributed to by no lesser a person than Charles Darwin the playing of such games in species names was described as "in very bad taste, and is especially calculated to bring the science into contempt". (That must have been a fun group to be involved with) ..... but wait there's more. The specific name novaguineae was used because it was thought that the first specimens of this species were from New Guinea - which they were not! They were from New South Wales! So the whole name is a bit of a joke all in all! 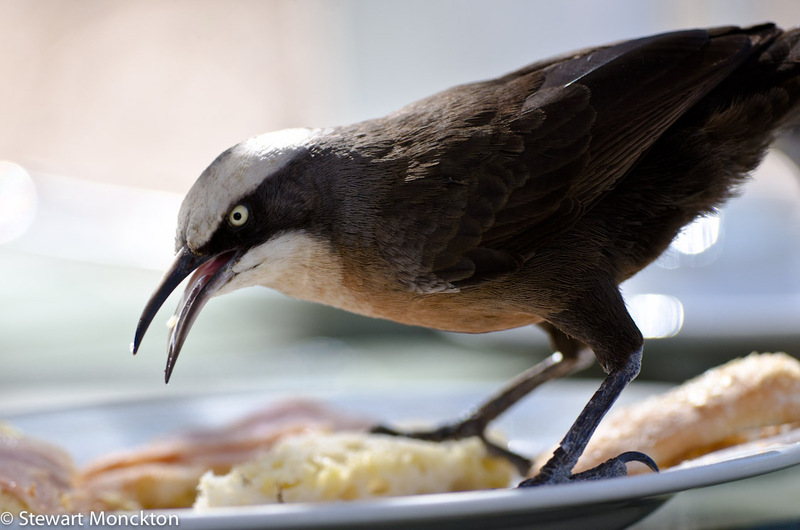 So here are some pictures of the anagram bird from the wrong country! The laughing kookaburra is found down the east coast of Australia - but is also common in a small part of Western Australia and Tasmania where they were introduced. 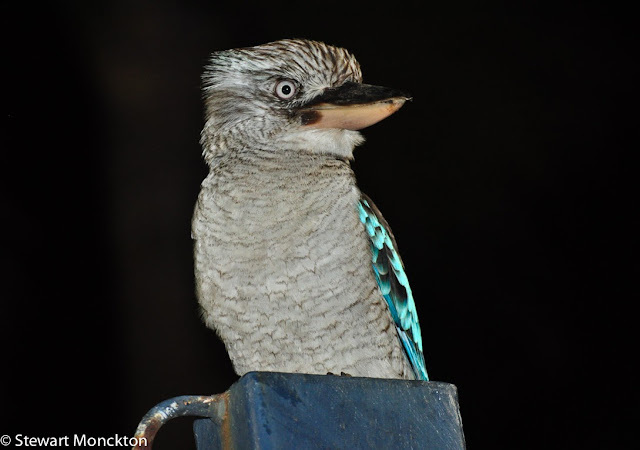 Many people may not be aware that there is another species of Kookaburra in Australia - the Blue Winged Kookaburra (Dacelo leachii). 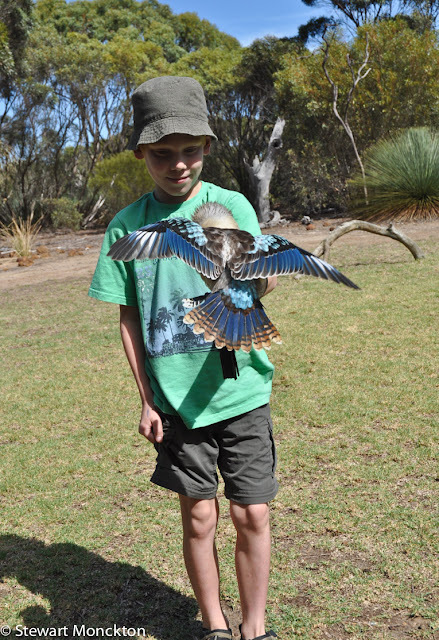 This bird is name for its blue wings (!) and William Leach who described it. 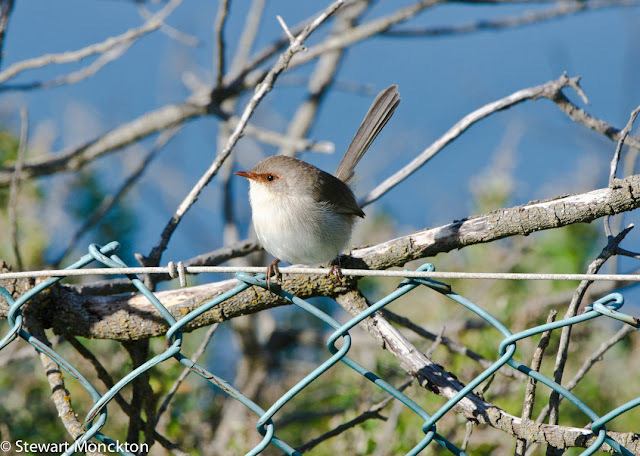 The voice of this bird is described as "Appalling, a guttural 'klock, klock' developing into a cacophony of mechanical squawks and screeches" - and while this bird is not the most tuneful I listened to, this seems a bit harsh. 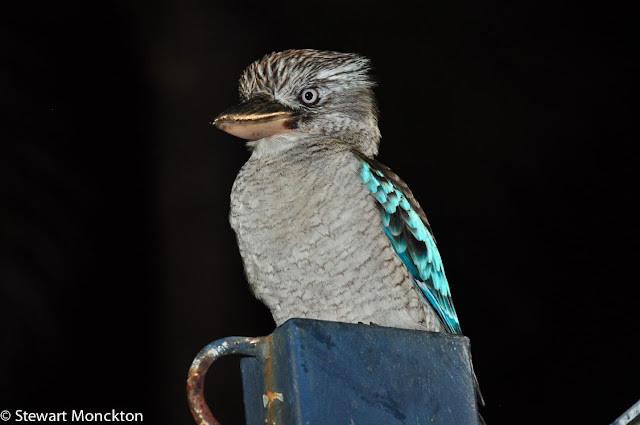 The first two images are of a Blue Winged Kookaburra sat on a light pole at a restaurant on Magnetic Island - I have no idea why the bird has a golden beak! As you can see it was at night! This next picture is not one of H's best - but it does show the blue wings and tail of this bird rather well - this was taken at a falconry display on Kangaroo Island. This bird (an occasionally this boy!) 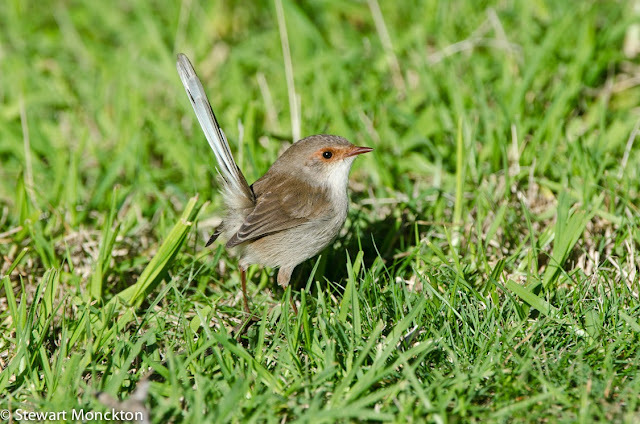 is found in Northern Australia - which is why is probably less well known than its Laughing cousin! And that just about wraps up the One Year Anniversary Post for WBW. A few weeks ago I took a boat trip around Phillip Island - which is about 2 hours east of Melbourne. 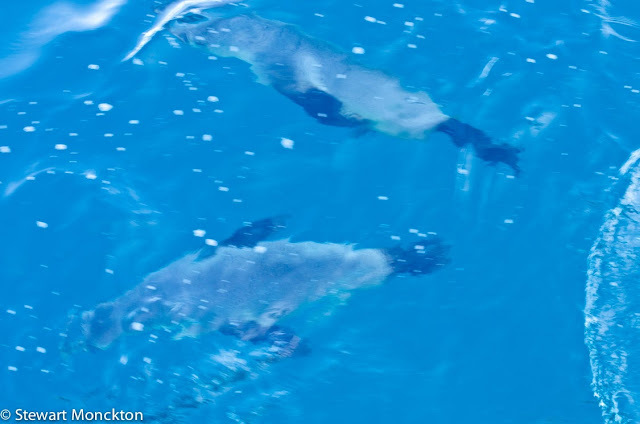 We were looking for whales, seals and albatross - and managed to see all three. As well as taking my normal sort of shots I was looking to get some images of a less straight forward type. At seal rocks we were visited by almost all of last seasons surviving seal pups - like dogs with flippers as they were described. 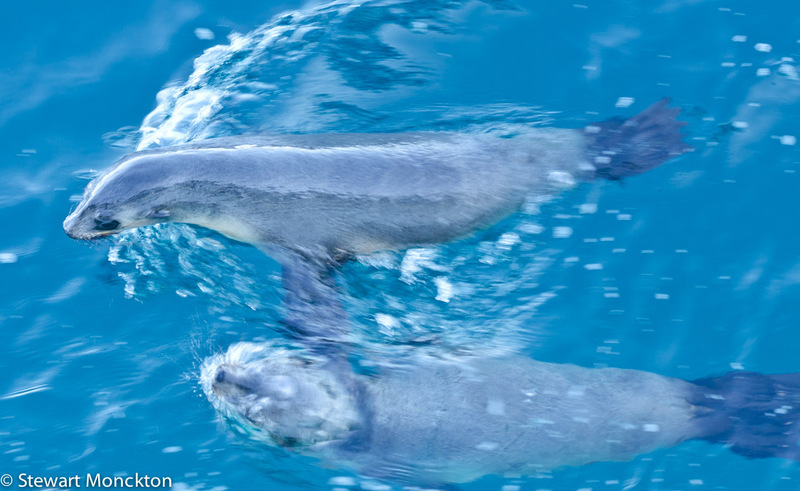 These were not seals that come around the boat because they are used to being fed - this is just inquisitiveness. 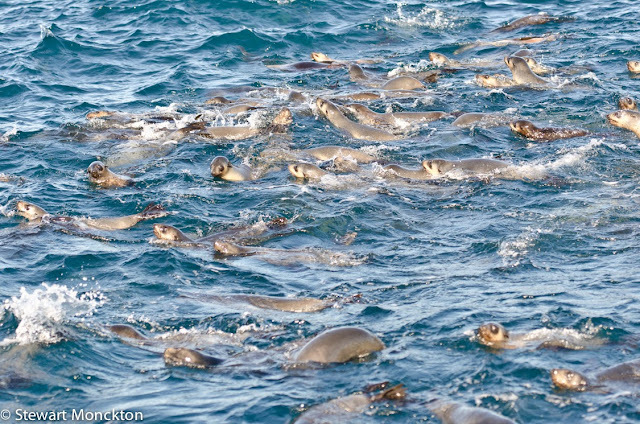 As you can see there were lots of seals in the water - which I actually found made it hard to get a focused shot. (Not one that was in focus - but an image with a real focus). 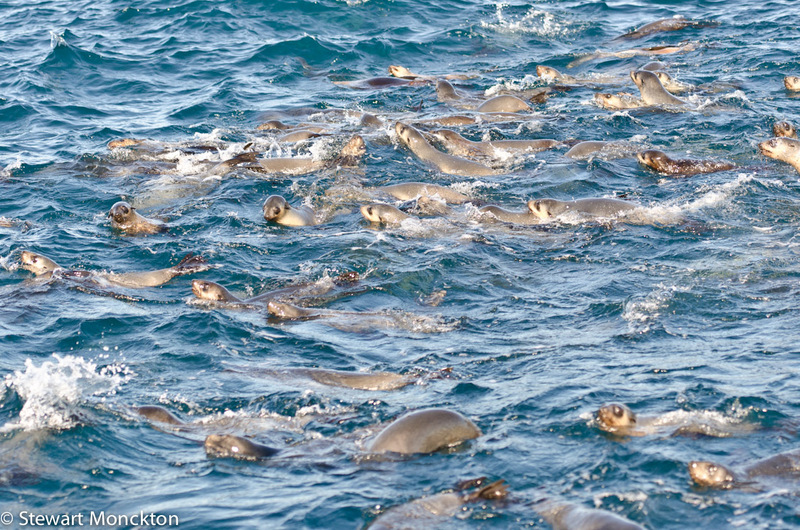 And although not sharp - these seals are fast I like the movement and life in this next image. You can find more images from around the world at Our World Tuesday. Hope you enjoy the pictures. I can never resist a walk on a pier or a jetty - they seem so inviting. Even when nothing is really happening you can find something to look at. I think this fine fellow had given up on the possibility of anythings happening a long time ago! 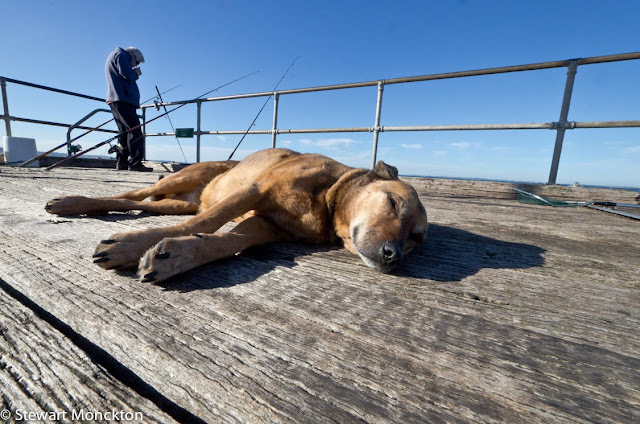 The most interesting thing to look at was some crazed photographer lying on his stomach pushing a lens up the nose of a dog! This is another shot where I tried to blend stone, sea and sky into a single image - you can see my other attempt here. 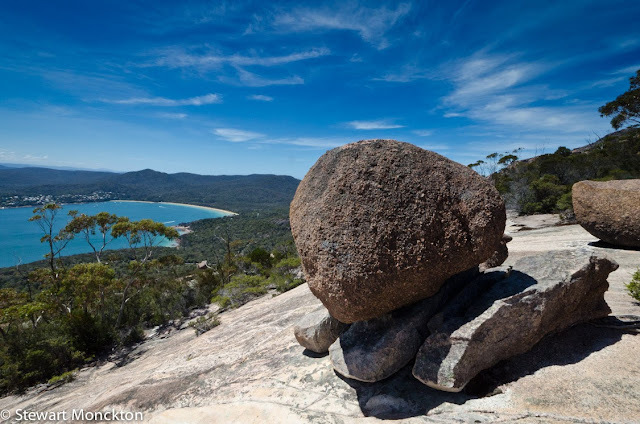 These granite boulders can be seen on the walk up to the summit of Mount Amos in the Freycinet, Tasmania. 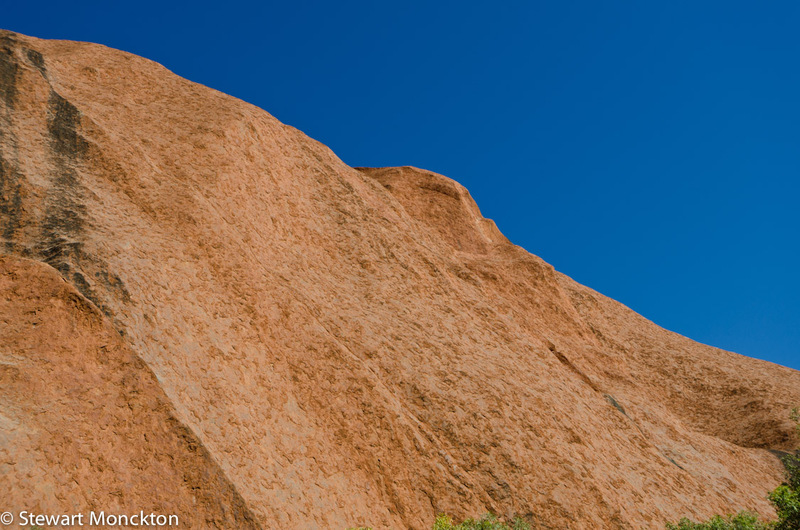 I like the way the clouds (sort of) point in towards a path of blue sky over the boulder. But most of all I like the fact that this was taken on a great day, when both of my small people climbed a big hill - or even a small mountain! Fairy-Wrens are delightful little birds that are often found in busy family groups. They seem to be able to move at near light speed when you try to photograph them. 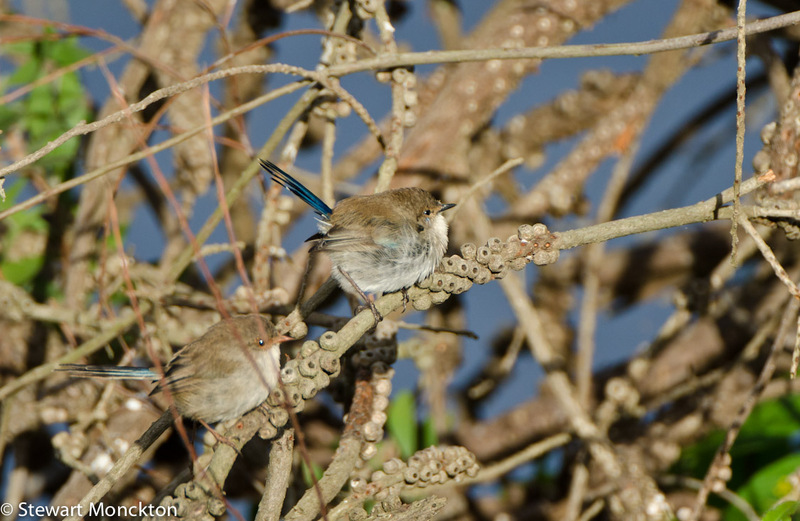 So I was pleased to find this rather more cooperative than normal family of Superb Fairy Wrens at Flinders a fe weekends ago. These birds go by the scientiifc name of Malurus cycneus - with the genus name meaning delicate tail and the species name meaning blue - so we have "blue delicate tail". 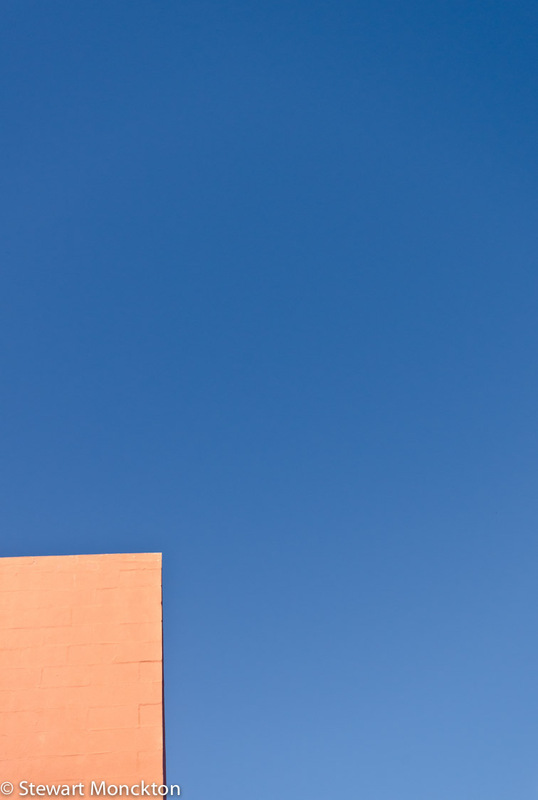 Which of course would lead you to ask - "So, where is the blue?" Unfortunately the male birds are not at their most superb at this time of year - I'll have to wait until the spring for those shots! The last picture here is of a male - you can see his blue tail and the lack of red around the eyes and towards the beak . Now its over to you to join in with WBW - click the link and off you go. Don't forget to link back to here to visit and invite. Next week WBW (in this version) will be 1 year old! So, I think I may have to celebrate.